If you follow me on instagram (dwellingsbydevore) then you'll recognize this little guy. I picked him up on clearance at hobby lobby for around $8. 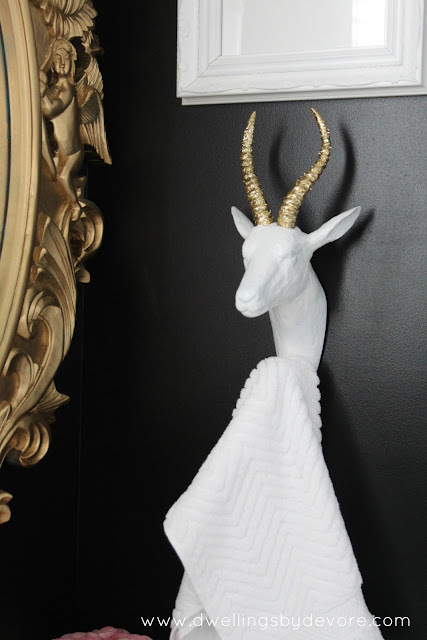 I've been wanting to add just a touch of taxidermy to our home, but never could find the right piece for the right price. So, when I came across this little fellow it was a no brainer. I actually didn't mind the finish on it for a more masculine space, but I wanted this to go in my daughter's bathroom so girly and glittery it was. 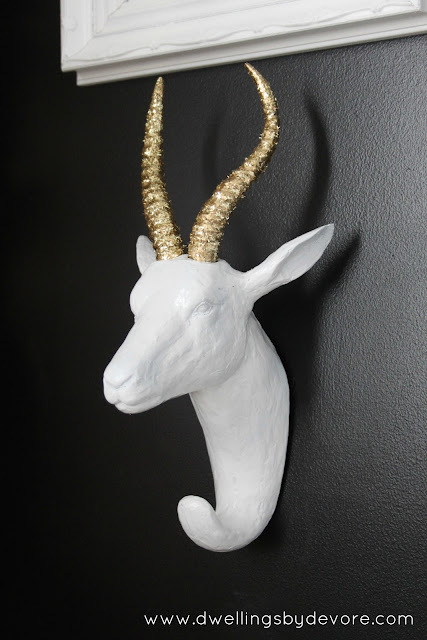 I removed the antlers (they just popped right out) and gave the body a few coats of glossy white spraypaint. I had someone ask a while ago about whether or not I prime when I spraypaint. I don't unless I'm spraypainting something super shiny or slick or something that I know is going to get a lot of use. Also, a lot of spraypaints are now made with built in primer so you can usually skip that step when using those products. Once the body got a coat of white, I spraypainted the antlers gold. I planned to bedazzle them with some gold glitter, but wanted to create a gold backdrop just in case the glitter didn't completely cover the surface. I'm glad I did this step because the glitter didn't completely cover the surface. 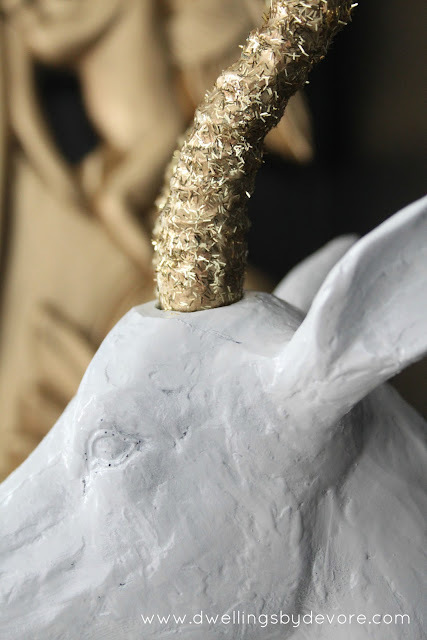 Once the gold paint was dry, I used a foam brush to coat the antlers in glue and then sprinkled them with some gold glitter. I picked it up on sale at Michaels for my daugther's party and had plenty leftover. This glitter is more like little strips instead of small dots like normal glitter so it added a little bit more texture to the antlers. I think if I try this again I'll do just regular glitter, I think it would adhere and cover better. We had a boring towel ring in this bathroom before so I thought this would be a great place to use this hook. This bathroom is used for guests as well as for my daughter so I like that it's feminine and girly but still sophisticated. I can't seem to find this hook on Hobby Lobby's website so I would check your local store, probably in the clearance section if you are interested. There's some great plastic taxidermy on ebay that would be great for this project. I think something like this deer would be great because of the large antlers. It would make such a statement to have them covered in glittery gold. 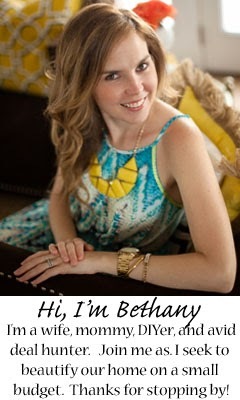 Bethany! You are SO talented and come up with the most creative things! Want to come do my house!? haha :) Love this little update! He looks SO much better! Your bathroom is gorgeous! Awesome! You managed to do it again. I love this idea so much! I love that not only is it functional but its a great conversation piece for a guest bath!! Am following you now ;) on IG. Love this head. So you and so me! You seriously always find the best stuff! Love this. Thanks so much! Amazing what a little spraypaint can do! It looks SO AWESOME! I love it! 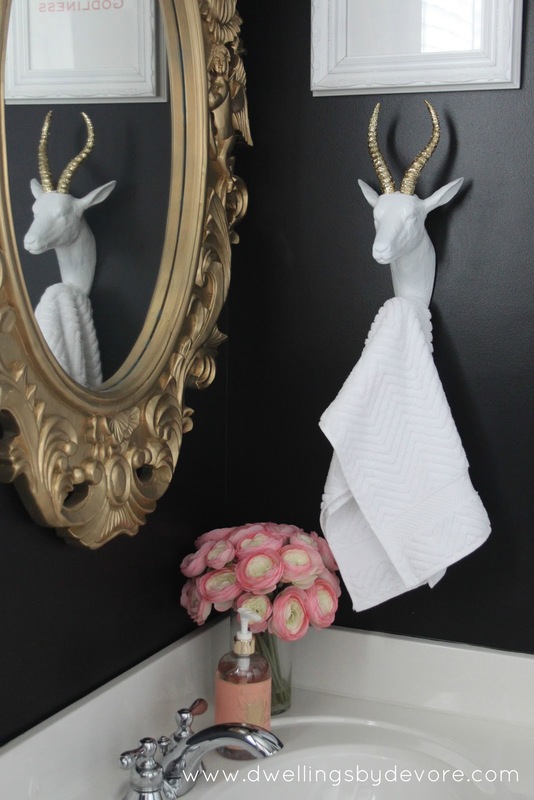 It adds a great touch of whimsy to an already gorg bathroom. Great job! This is so adorable!! I seriously think spray paint can fix ANYTHING! The hook looks so great against your black walls. Nice job! What a fantastic post - it is SO adorable! I love your bathroom design! Thank you! I was kind of scared to paint it black at first, but I'm so glad I went for it! This is so fabulous! I really love it...and now I'm a new follower. That is so creative! I love the combo of white and gold. Looks amazing in your bathroom. So glad I saw this over at the ditto diy challenge! That is STUNNING! I LOVE the way it looks against the black wall. Now i want to go paint my whole house black! 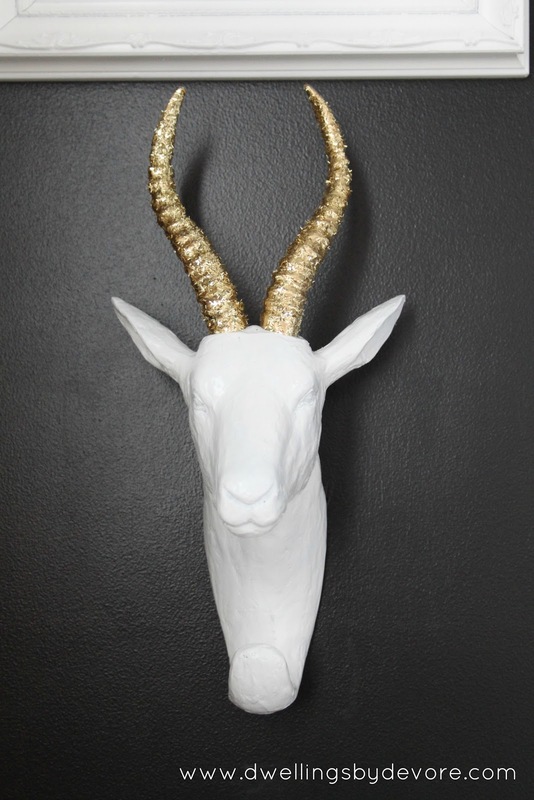 How long (including antlers) and wide is this antelope?